One of Pixar’s most beloved films was the 2004 animated classic, The Incredibles. For years fans have wanted a sequel, and writer-director Brad Bird finally relented. Incredibles 2 was finally released to theaters this year with great fanfare and became another smash hit for Pixar’s library. Now, the animated feature is available on home video starting this week. The Movie: As stated in my earlier review, Incredibles 2 is an ultimately satisfying and strong sequel. While it doesn’t quite meet or surpass the original, it’s still a worthy sequel and successor. Brad Bird did an excellent job of continuing from where the first movie left off and also expanding on the world he established, that is a world where superheroes and superhero activity are still illegal. After a fight with The Underminer doesn’t go very well, Bob Parr, aka Mr. Incredible, and his family of uniquely super-powered superheroes are in a bit of a bind. They are living in a motel with no source of income. However, they get an intriguing offer from Winston Deavor (Bob Odenkirk), a hotshot CEO who wants to spearhead efforts to make superhero activity legal again by filming their exploits. As a result, Bob’s wife, Helen aka Elastigirl (Holly Hunter), is given the opportunity to be the face of Deavor’s project. That means that Bob has to play stay-at-home dad while Helen gets to play hero again. Meanwhile at home, Bob is struggling to deal with Violet’s mood-swings, who is angry about a boy she likes getting her memories erased. Also, Jack-Jack has so many powers that Bob can barely keep up with them. For her part, Helen has to deal with a sinister new threat called the Screenslaver, who can brainwash seemingly anyone using technology. Incredibles 2 is still a great superhero movie despite having to wait 14 years and coming out at a time when there’s a tremendous glut of superhero films. Brad Bird brings his topnotch direction and strong writing sensibilities to the table. The writing in the film is incredibly clever, and the dialogue and execution has a very natural feel. His stories never talk down to the audience. Hopefully, it won’t be another 14-year wait for another installment of the franchise. 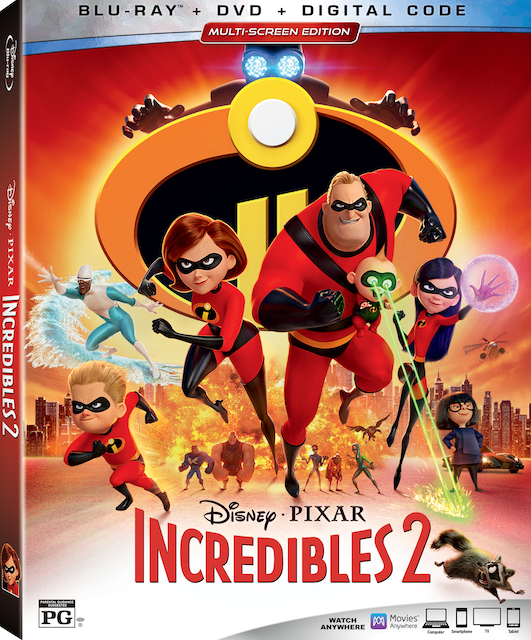 Blu-Ray Info: The Blu-ray/DVD/Digital Copy multi-screen edition release for Incredibles 2 is a three-disc version: One disc is for the Blu-ray version of the feature film; and the other is completely dedicated to Blu-ray special features. The multi-screen edition also includes a single extra disc for the DVD version of the film. It’s packaged in a standard Blu-ray clamshell case with translucent blue plastic. There’s a slip cover for the Blu-ray case. Besides two Blu-ray discs and one DVD, there’s also an insert with a download code for the digital HD version of the film. Video Info: The Blu-ray edition is presented in widescreen with a 2.39:1 aspect ratio at 1080p. The Blu-ray transfer looks crisp and sharp. Pixar animators did topnotch work creating a retro-futuristic world with some amazing animation. This is a superhero world that’s evocative of Golden Age superhero comics, and it looks fantastic onscreen. Audio Info: The Blu-ray edition features an original 7.1 DTS-HDMA English language track. There are also optional 5.1 Dolby Digital tracks in Spanish and French. There’s also an optional English 2.0 Descriptive Audio Language track for the hearing impaired. Optional Spanish and French subtitles are also included on the disc. The film’s sound transfer sounds clear and high quality. Thankfully, Michael Giacchino returned to provide the score for the sequel, and it’s great to hear his score again. Special Features: The Blu-ray release includes extras on the main disc and a whole separate disc extras. Overall, there’s a nice variety of extras here that will engage fans of the franchise and animation enthusiasts. Feature Commentary: There’s a nice feature-length commentary featuring an introduction by Brad Bird and animators Dave Mullins, Alan Barillaro, Tony Fucile, and Bret Parker. They provide an engaging and informative commentary. It’s especially nice to hear the animators’ perspective, especially since they are usually the unsung heroes of project like this. Bao: This is the wonderful animated short that accompanied the release of Incredibles 2 in theaters. Auntie Edna: This is easily one of the star features of the Blu-ray release. This is basically the Incredibles 2 version of Jack-Jack Attack from when the first film was released on home video. This time, Edna Mode is playing babysitter for Jack Jack. Edna’s reactions and general calmness dealing with Jack Jack’s chaotic powers is hilarious, so it’s nice to get a nice little short that provides a bit more context on what Jack Jack was doing when he was staying at Edna’s place. Strong: A Lesson in Animation with Brad Bird: This is a near 19-minute featurette on the first disc showcasing writer-director Brad Bird. Bird shares some interesting anecdotes on how he was mentored by legendary Disney animators, his early influences for animation, and also his transition to becoming an award-winning animator and filmmaker. There’s some nice interviews with the crew talking about Brad Bird’s methods as a director and the energy he brings to every project. One of the most interesting stories was Bird discussing how influential getting the book Walt Disney: Magician of Movies was for him in his youth. Deleted Scenes: There’s a nice group of deleted scenes here. They can be viewed individually or all together as a single 40-minute feature. Brad Bird provides intros for each deleted scene with reasons for why the scenes were conceived and ultimately cut. All the scenes are still in their animatic form and don’t have finished animation, but they are edited, though not all have the final voice work. There are a number of interesting scenes that do flesh out more of the world. Characters and threads from the first film are also revisited. None of the deleted scenes look like huge losses in terms of the overall story, but they are welcome additions to the special features. The most interesting one was Mr. Incredible providing a eulogy for his fallen friends who were previously murdered by Syndrome offscreen in the first film. It’s a very weighty, dramatic and emotional scene that does reinforce that the stakes of this world are very real. Super Stuff: This is a six-and-a-half minute featurette about the film’s retro-futuristic look, the overall design of the film and characters, and more. Paths to Pixar: Everyday Heroes: This is an 11-and-a-half minute featurette about the staff at Pixar and how they find inspiration to the visual performances of the movie and more. Superbaby: This is a music video about the making of the film. It features the characters Paige and Frankie from the Disney Channel series Bizaardvark. Making Bao: This is a six-minute behind-the-scenes featurette on the making of the delightful Pixar animated short film. Heroes & Villains: This is a series of mini-documentaries on the central characters in the film, including the actors, the new heroes and the villains. These behind-the-scenes featurettes can be viewed individually or all at once as a single 25-minute feature. Interestingly enough, Brad Bird notes that he modeled Mr. Incredible after himself and his father. Vintage Toy Commercials: Toys based on the film use the theme songs for the characters in a retro style. These are nothing special. Character Theme Songs: The hero theme songs that were referenced in the movie are presented here for Mr. Incredible, Elastigirl, and Frozone. Trailers and Promos: Finally, we have a group of teasers, trailers, and promos for the film’s theatrical release. Incredibles 2 is a great sequel to the original with exceptional writing and direction by Brad Bird that does a good job of continuing the story that started with the original, while also expanding the world of superheroes that Pixar created. The Blu-ray release features a nice mix of extras with a lot of content that fans will enjoy. There's extras tailored to family members both young and old. Adults and animation enthusiasts will enjoy the commentary, Strong Coffee, and the deleted material. The shorts like "Bao" and "Auntie Edna" are great for the whole family. It's a worthy addition to any Pixar collection.